Fiori del Conero is situated inside Conero Park on a hill close to the sea and in the tranquil village of Pietralacroce. To understand how the name of this brand new accommodation facility hits the nail right on the head, all you need do is think that Mount Conero takes its name from the strawberry tree, which was called Komaròs by the ancient Greeks. This plant, typical of the Mediterranean scrub, is the only one that bears fruit, flowers and leaves at the same time. Fiori del Conero, therefore, could not have emerged in a better spot than this. If you then add to this the activity of the Ciavattini family, who for years have run a flower growing business producing ornamental plants, both for inside and outside, you can remove any doubt you may have had. You can rest assured that the same refinement, sensitivity and attention reserved for the most delicate flowers, is also reserved by the Ciavattini brothers for their own guests. The accommodation is ideal for those that want to keep their own autonomy and independence whilst on holiday, and who prefer to stay in apartments equipped with independent kitchens. Each one of the seven apartments and two bedrooms are characterised by the name of a flower that grows in the Conero area, and the colours of the furniture and the walls match these themes. All the apartments are very spacious, fitted out with fully equipped kitchens, and some of them are also provided with outside barbecues to allow you to be able to prepare grilled bruschetta, meat and fish, with a stunning view of the surrounding countryside and the sea in the distance. 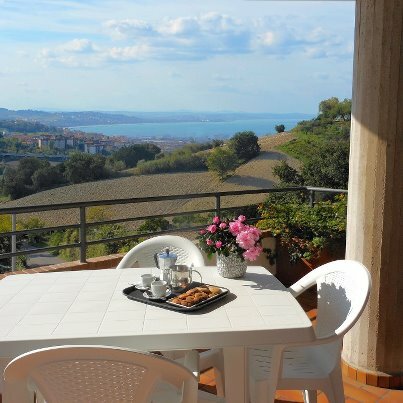 In fact, the building offers evocative scenic views, both of the sea and the hills of Ancona. From here you can look out onto the Bay of Ancona, and a few hairpin bends away you will find the marvellous Bay of Portonovo. 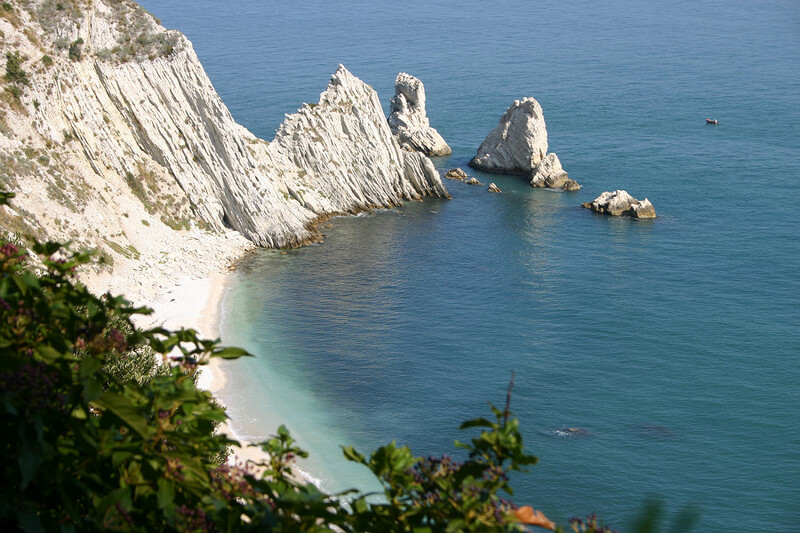 In a few minutes you can reach the beaches of the entire Conero coastline, like those of Sirolo and Numana, which for years have possessed the Blue Flag. The size of the apartments and the quality of the furniture are especially surprising. Also, every apartment or room is extremely functional and responds to every demand. For example, if you travel as a group, here it’s possible for you to connect the apartments so you can cook and eat all together, whilst maintaining the privacy of the bedrooms with en-suite bathrooms. You will be able to breath in the uncontaminated fresh air of the surrounding nature whilst remaining only a stroll away from the city. The building is modern, but is set harmoniously into the surrounding landscape. Fiori del Conero has nine accommodation options, which all different in terms of dimensions and services equipped to meet your every need: six apartments, one studio and two bedrooms. All the rooms are provided with all the mod cons: air conditioning, satellite TV and Wi-Fi Internet. Each residence is named after a flower which you can find with the park’s grounds. And so, amongst others, you’ll find the daisy room (and “it’s actually a photo of a wild daisy that grows along the entrance path to the splendid Mazzavalle beach,” Eugenio points out) and the rose apartment (“the photo is of the wild rose that we grow right here in our garden,” Eugenio explains to us). The furnishings are uncomplicated: each room is characterised by a different nuance of colour, which go from the warm tones of the land to the blues of the sea, and the appearance is modern and fresh. 1. Anemone: Two room apartment of 34 m2 with two beds and the possibility of an extra one for children. Different hues of the colour blue run on from one another into the various rooms: twin/double bedroom, a fully equipped kitchen, a bathroom with shower, a utility room, a safe, a satellite TV, Wi-Fi and air conditioning. 2. 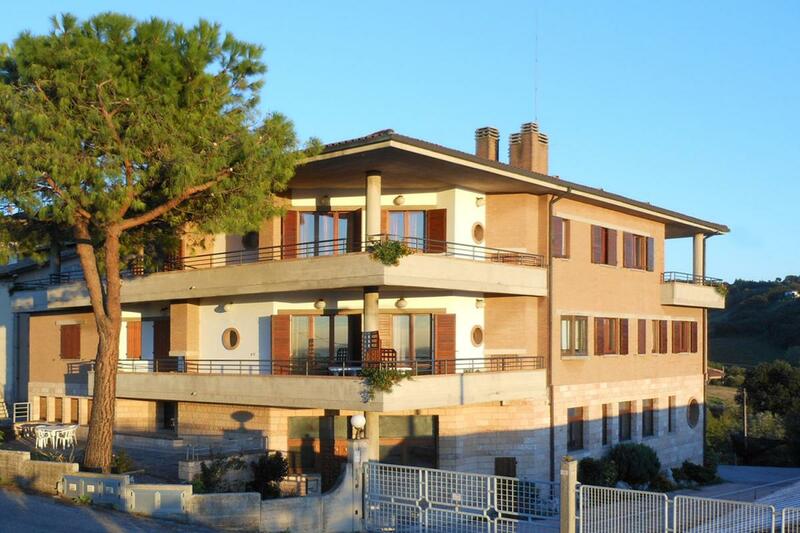 Cyclamen: Two room apartment of 44 m2 with three beds and the possibility of an extra one for children. The flooring is parquet and the dominant colour is the rose that characterises the furniture’s fabrics. It consists of: twin beds/double bed, a fully equipped kitchenette, a fold away single bed, a bathroom with a shower, a utility room, a safe, a balcony, a satellite TV, Wi-Fi, air conditioning. 3. Broom: Two room apartment of 76 m2 with four beds and the possibility of an extra one for children. Brightened up by the details of the nuanced yellow and the pale flooring, the apartment is composed of the following elements: twin beds/double bed, a living room with a fully equipped kitchen and a fireplace, a double sofa bed, a bathroom with a Jacuzzi, a scenic covered terrace, a barbecue, a satellite TV, Wi-Fi and air conditioning. 4. 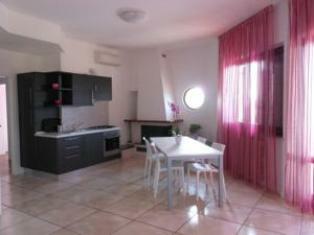 Lavender: Two room apartment of 64 m2 with four beds. Consists of: twin beds/double bed, a living room with a fully equipped kitchen and a fireplace, a double sofa bed, a bathroom with a Jacuzzi, a scenic covered terrace, a barbecue, a satellite TV, Wi-Fi and air conditioning. 5. Daisy: Twin/double bedroom of 19 m2 with two beds. The room is equipped with a mini-bar, a bathroom with a shower, a large covered scenic terrace, a satellite TV, Wi-Fi and air conditioning. 6. Poppy: Two room apartment of 37 m2 with two beds and the possibility of an extra one for children. It consists of a twin/double room, a fully equipped kitchen, bathroom with a shower, a satellite TV, Wi-Fi and air conditioning. 7. 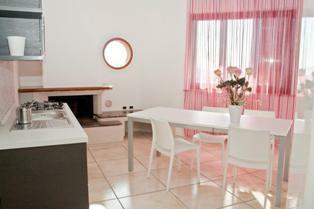 Rose: Two room apartment of 66 m2 with four beds and the possibility of an extra one for children. The rooms are very large and bright with tones of pink: twin/double room, a living room with a fully equipped kitchen and a fireplace, a matrimonial sofa bed, a bathroom with a Jacuzzi, a large scenic covered terrace, a satellite TV, Wi-Fi and air conditioning. 8. Tulip: Twin/double room of 24 m2 with two beds and the possibility of an extra one for children. The room is equipped with a mini-bar, a bathroom with a shower, a large scenic covered terrace, a balcony, a satellite TV, Wi-Fi and air conditioning. 9. Violet: Studio of 26 m2 with two beds. The fully equipped kitchenette gives you the independence of self-catering even in contained spaces, while the large terrace means you can eat lunch or dinner outside. The studio is equipped with twin beds/double bed, a bathroom with a shower, a utility room, a safe, a scenic covered terrace, a balcony, a barbecue, a satellite TV, Wi-Fi and air conditioning. For the convenience of each guest, the owners have really thought of everything: from the safe to the barbecue, as well as the double rooms with the possibility of placing the beds in adjoining apartments for groups of friends (the Rose and Poppy apartments and the Daisy room can be connected according to guests’ needs). – The Relax Room is made welcoming by the wooden beams and the large fire in front of which you can relax during winter, whilst the wood-burning oven and fully-equipped kitchen also make it ideal for cooking courses. – The Multi-purpose Room, suitable for events, meetings and educational courses, can accommodate about 25 people and has direct access to the garden. – Free private car park. Also, you can literally immerse yourselves in the flowers thanks to the greenhouse tour, with lots of explanations and illustrations from the company’s proprietors, who will accompany you during the tour and respond to your questions. For sport lovers, the choice of activities to take part in this area is certainly vast: from tennis courts, a few metres from the accommodation, to the golf course, from the swimming pool, to the equestrian centres. On the first Friday of every month it’s possible to see and admire up close the magic of the stars in the sky. The sea also offers, besides the stunning Blue Flag beaches on the Conero coast, the possibility of going diving, wind surfing, kite surfing, sup, deep-sea fishing and also boat trips with dinner on board. Lastly, when you make a booking it’s possible to request additional services, like a guided tour in the historic centres of surrounding towns.